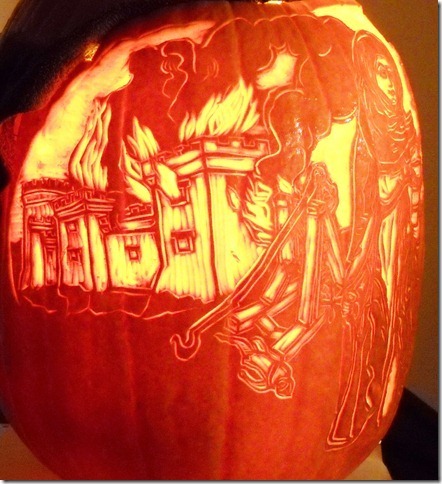 Nerluc in flames (pumpkin carved by Barry Galef). Photo by Barry Galef. Every year, Reveler Barry Galef brings us a special treat: One of his carved pumpkins. These aren’t the jack-o-lanterns you’re used to, with the triangles for eyes and the half-moon for a mouth. He treats the pumpkin as a work of art, carving a detailed scene into their orange skin. The pumpkin always relates to the theme of the Christmas Revels. 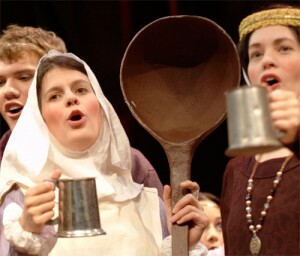 We had a flying canoe for the French Canadian show in 2008 and Henry VIII for 2007’s Elizabethan show. (Hey, he was Elizabeth’s dad.) So during the break in tonight’s rehearsal, we all filed upstairs to the mezzanine to ooh and ahh over this year’s offering. 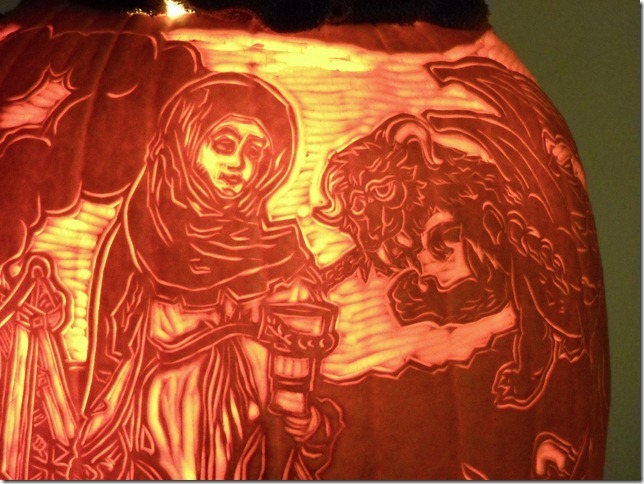 The main pumpkin this year has the tale of Saint Margaret and the Tarasque. The Tarasque is a sort of dragon-like creature with lots of legs. It makes an appearance this year in the Christmas Revels, as the monster in the mummers play. In the story, the Tarasque ravages the town of Nerluc, in Provence, and sets it on fire. Taming the Tarasque (pumpkin carved by Barry Galef). Photo by Barry Galef. You can see some more of Barry’s pumpkins on his website.